3 in the nest: this post brought to you by the letter "A"
We began the alphabet again this week. Caroline works on her penmanship, phonics, and writing words that begin with the letter of the day and the twins work on recognition, sounds of, and practice writing. We did some fun things this week: pancakes shaped like the letters (no pictures. my kids are early risers but I am not functioning let alone thinking about my camera at 6:30 a.m. I will tell you equal parts pancake mix to water and a squeeze bottle make shaped pancakes a cinch), peanut butter and goldfish lunch shaped like the letters, and my personal favorite...sugar cookies. If those letter "A" sugar cookies look funny to you its because they are letter "V"s. I bought a box of 100 shaped cookie cutters (a great set that has the alphabet, numbers, shapes, animals, and sports) and wouldn't you know that it was missing ONE cutter...the letter "A". What a fun way to learn! I'm going to have to take notes so I can remember to do these types of exercises with Nolan when he gets older! 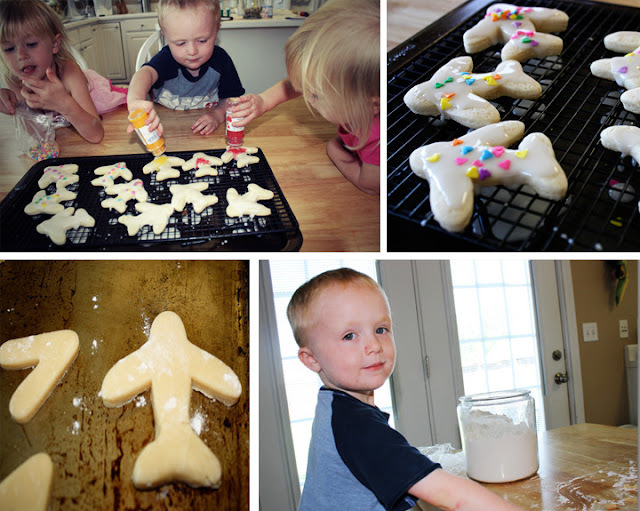 We made sugar cookies this week too and I immediately thought of you :) Too funny! This comment was brought to you by the letter "C" - for comment and caffeine! Love it Kristen! Your kids are so lucky! What a great idea! We also like to do letter fries. See learning CAN be fun...and delicious. Awesome! (also an A word, lol). 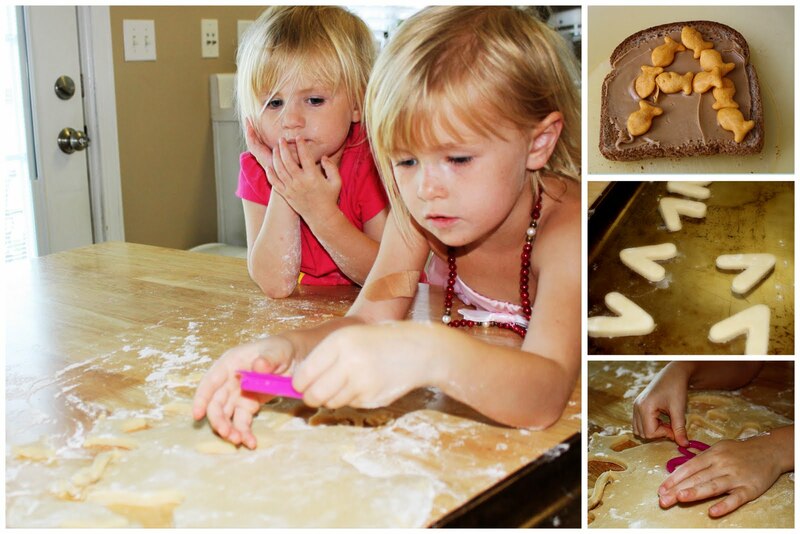 The peanut butter and goldfish "A" sandwich is such a yummy and cute idea! Kids will never forget that! What an amazing way to learn! I love how you improvised with the letter V; too cute! I'm your newest follower, Kate. I added your blog button to the "Button Parade" on my sidebar. Can't wait to read more of your charming blog!